For any Chicagoan stepping foot outside their apartment recently, it's obvious that we're pretty far removed for our Big Short recession slump as major construction is booming again. Cranes are as familiar a sight in River North as designer pooches and $14 cocktails. With so many major developments going on all over the city it’s clear some parts of our beloved Chicago are going to look very different in just a few years. Here’s a preview of some of the biggest changes coming to the Windy City set to take place by the year 2020. While the renovation of the historic stadium rightfully took center stage for years, for most Lakeview residents the biggest impact is coming in across the street. 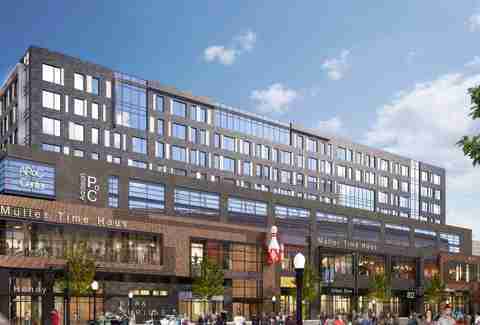 A boutique hotel is taking the place of the Wrigley McDonald's -- a new one is planned to open up in the hotel for your late-night McNugget needs -- and the assorted gravel lots around it. Which is fantastic news for neighborhood residents who wanted Cubs fans to spend even more time packing the Red Line and running into them on the sidewalk. An even more prominent structure will take up the entire block on Addison between Clark St and Sheffield Ave, with almost 150 apartments and plenty of street-level retail. 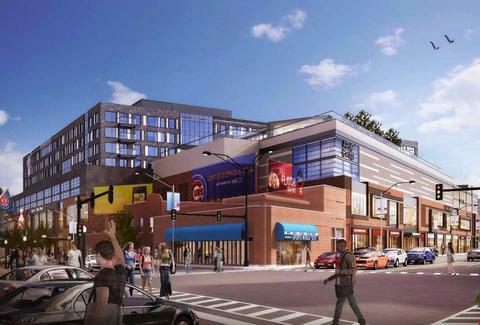 Neither building is replacing anything too beloved by the neighborhood, and the extra parking will hopefully ease some game-day pressure in the area, but both are sure to contribute to the madhouse that is Cubs games. 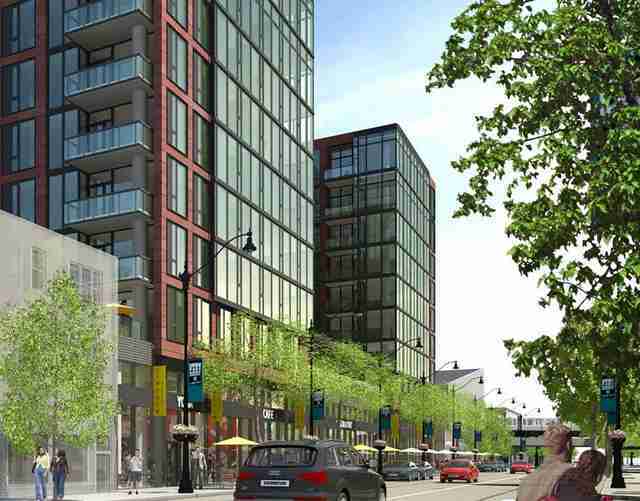 The boom of recent high-rise construction in Chicago hasn't veered into Lakeview until now with a highly visible project currently underway on Sheridan Rd. 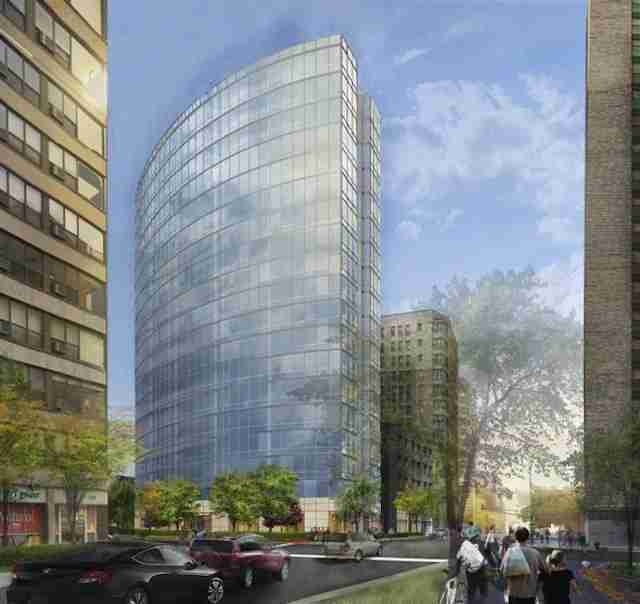 At 19 stories and with a modern curving glass form, this 82-unit building is sure to stand out among the older brick buildings surrounding it. Just as noticeable are the astronomical rents, expected to start at $2,900 a month, and the buildings success could mean more luxury developments like this one for the neighborhood. After a drawn out battle, it seems the long-awaited development of Lathrop homes will be moving forward. While public housing advocates have been fighting the proposed development, claiming the city reneged on a promise to build replacement structures elsewhere, the Chicago Plan commissioner approved the redevelopment in February. 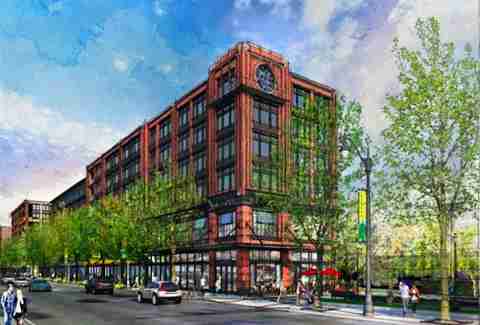 The project will erect several new mixed-use buildings along Clybourn and Diversey, which will bring some much needed pedestrian-friendly retail space the corner, and restore 14 of the historic '30s era structures for new apartment use. The plan also calls for restoring acres of green space along the river. While mid- and high-rise projects have been dotting the city over the last few years, Chicago hasn’t gone BIG big since the Trump Building and Aqua were finished in the wake of the housing collapse. 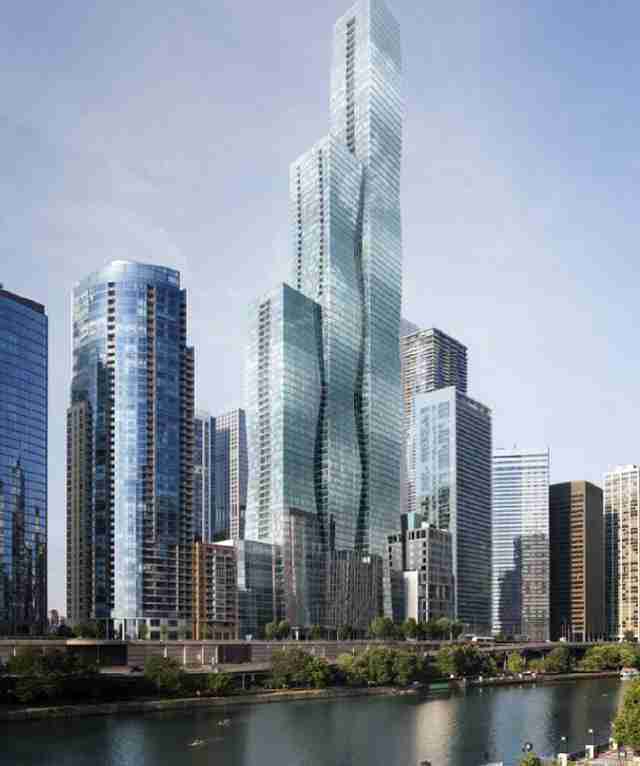 That ends with Wanda Vista, which will cast an imposing shadow over the east end of the Chicago River with three skyscrapers designed by Jeanne Gang. 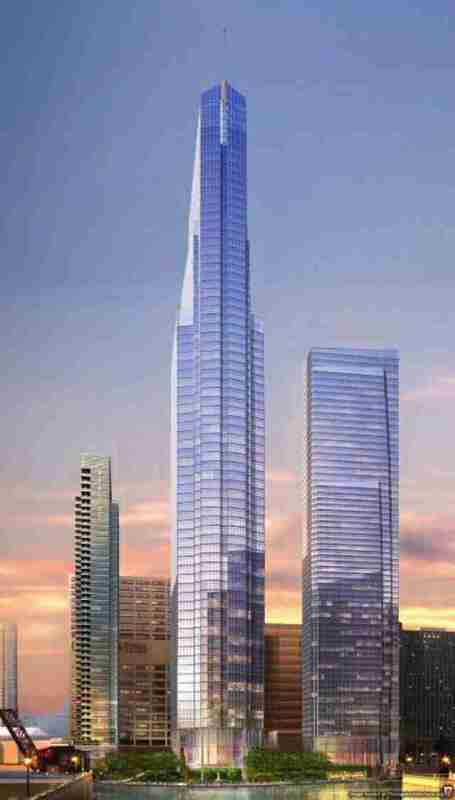 The tallest building will surpass the Aon Center as the third largest in the city and set a new standard for the Lakeshore East neighborhood. With Wanda Vista and 113 East Roosevelt, Chicago has finally gotten back in the business of building world-class architecture. 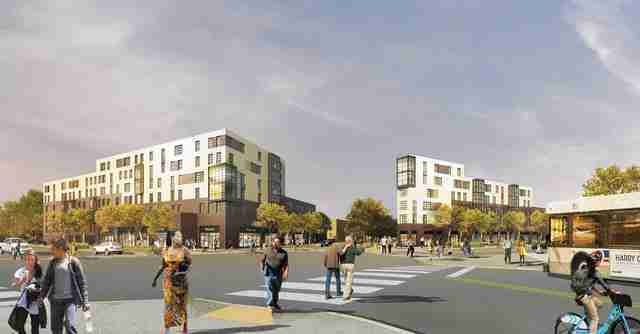 Approved by the Plan Commission back in December, the biggest project currently underway in Logan will completely reshape the 2500 block of Milwaukee Ave. The planned development will replace the abandoned Mega Mall with an entire block of apartments and storefronts. After local residents protested the initial projects' scale and generic design, developers responded with shorter buildings and a new brick and glass industrial design that is much more in tune with the neighborhood. While there are still concerns about a lack of affordable housing, the project should further cement Logan Square’s status as one of Chicago's fastest developing and most desirable hoods. One of the biggest projects taking advantage of the city’s transit-oriented development bill, the Dual Towers are currently going in right around the corner from the California Blue Line stop. Like the Mega Mall development down the street, it will bring a big swath of what was previously dead space on Milwaukee Ave back to life. Unlike the Mega Mall, both the modern design and the tower's height will really stand apart from surrounding buildings, impacting the feel and character of the California area. Whether developments like this guarantee Wicker Park-like gentrification or help alleviate price pressure on Logan’s low density housing stock remains to be seen. 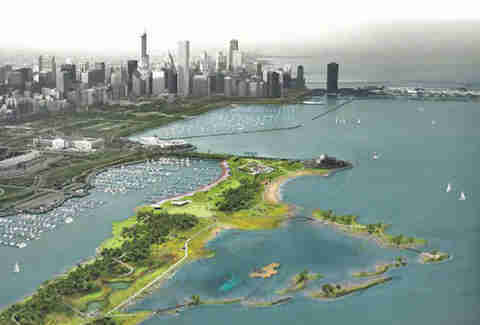 In its place we will get Northerly Island park, which opened its first 40-acre section last year. Several more phases will be opened to the public in the coming years, with a central lagoon (replacing the larger one in the renderings) and eco-conscious design featuring native Illinois plants meant to encourage wildlife to settle there. While the full growth won’t be complete for decades, the full park should be accessible soon and will bring another tract of green space to Chicago’s lakefront. The behemoth that is McCormick place will get two new big buildings right next door in Chicago’s ongoing attempt to revitalize one of the fastest-growing sections of the city. The centerpiece is the new multipurpose arena, which will host concerts, conventions, and the Big East powerhouse of mediocrity known as the DePaul basketball team (who only dropped $70 million on the new stadium when they could have had the United Center host all 400 diehard fans for free). 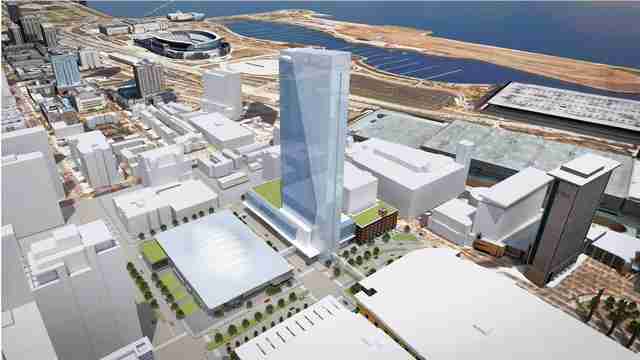 Across the street from the arena will be a boutique-style Marriott Marquis hotel which is betting big on continual convention traffic. Seeing as several other developments are already looking to circle this one, the Entertainment District looks like the beginnings of another major transformation for the East Cermak area. 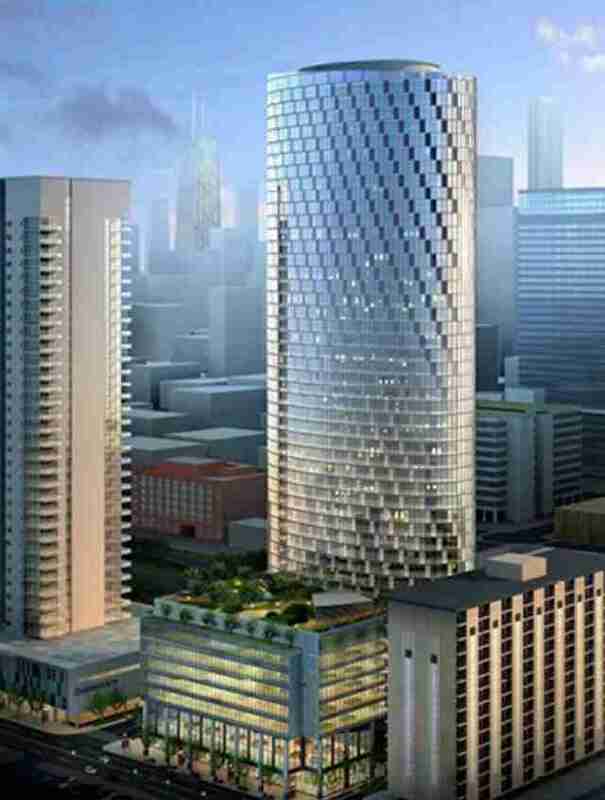 Standing over 800ft tall, the newly approved development at the corner of Michigan and Roosevelt is meant to be a memorable statement piece that will anchor Grant Park. 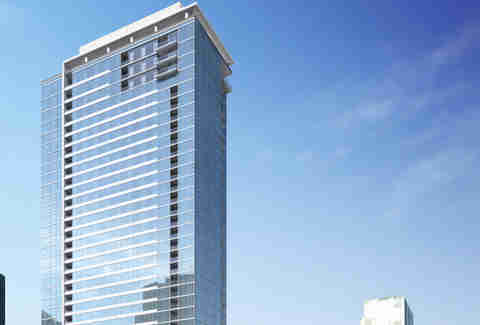 Once completed it will be the tallest building in the South Loop and the tallest all-residential structure in the city. 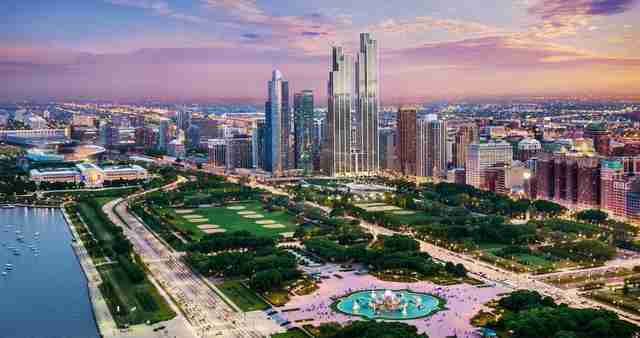 It will be a symbolic structure, not just for its size and Willis Tower-inspired design, but for what it means for the South Loop, which has seen massive projects coming back online after the 2008 crisis cut off its nascent explosion. Sitting at a major intersection in the heart of Lincoln Park a new set of buildings will take finally be going up to replace the long abandoned Children’s Memorial site. Standing out in an area mostly characterized by its historic row homes and smaller apartment buildings, the Lincoln Common development will raise two new glass facade apartment buildings and 60 condos on N. Orchard St. The old hospital high-rise will be demolished and the plans incorporate brick and terracotta buildings into a new stretch of store space, which should bring a host of new shopping and dining options along Lincoln Ave. The Lincoln Center, known to anyone riding the Red Line as "that building with the Tennis courts," occupies a location too prime for its measly four floors, and a design too ugly to be worth saving; therefore, it will be coming down. Along with the Lincoln Common site just a few blocks away Elevate Lincoln Park, as it has been dubbed, will add to the growing collection of luxury rentals along the spine of neighborhood. Retail space looks to be pretty similar to the current situation, but the building will tower over its neighbors and eliminate what was one of the most recognizable buildings along many a Chicagoans’ commute. Atrium Village as it stood was an interesting experiment, meant to bring a mixed-income community to the area, but the apartments large fenced-off green space and location set back from the street isolated it from its more urban surroundings. 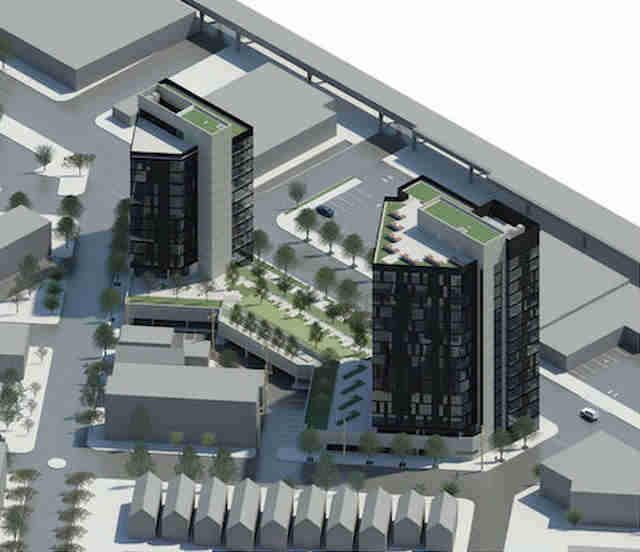 The overhaul of the Village will change all of that, turning an entire block of low density development into modern high-rises, connected to the street with 40,000ft of commercial space. There are plenty of apartment buildings going up all over the neighborhood but none will be as transformational as Atrium Village. There aren’t two many places in Chicago as prominent as Wolf Point, the confluence of the north branch and main stem of the Chicago River, and its getting a big facelift with the new Wolf Point Towers development. Formerly dominated by the dated Chicago Sun-Times building, the riverside site will get three sparkling new apartment high-rises sitting across the street from Merchandise Mart and visible far down the river. With the first phase nearly complete and phase two breaking ground River North is about to get a big influx to its already booming luxury market. At long last the Gold Coast will wave goodbye to its blight of a supermarket at the corner of Clark and Division. With its big street-level parking lot and run-down interior the old Jewel had been long holding back one of Chicago’s most desirable properties. In its place will be the Sinclair, a luxury residential high-rise with a brand new Jewel in the base to serve the neighborhood. The building will be a commanding presence among the brick and stone, but there is little denying the beautification this block needed, and it’s not as though the Gold Coast was particularly welcome to the mid range renter crowd before this anyway. 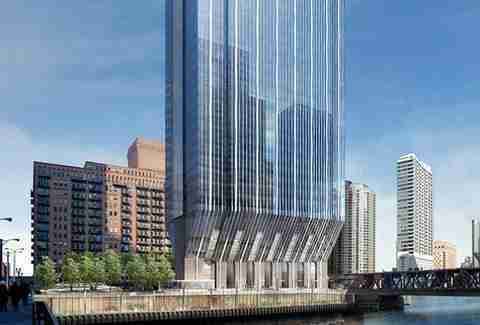 Sitting astride the Chicago River and the Lake St 'L' bridge 150 North Riverside will be a prominent new tentpole structure welcoming people to the West Loop. Unlike many of the other high-rises going up in the city Riverside is 100% office space, and is emblematic of the growing commercial push into West Loop area that rapidly developing the few unused or underutilized lots in the area. Resident and workers in this section of the neighborhood can be assured it is only a matter of time before the whole area is a tall and dense as the Loop itself. With the success of the Soho House Hotel and the neighborhood’s rep for destination dining the West Loop is seeing a not unexpected boom in hotel development. But while other parts of the city have been betting on towering 400-room lodging, developers in the West Loop have been more sensitive to both the areas ascetic characteristics and increasingly high-end clients by sticking to boutique hotel designs. Thus we get 200 N Green by the same firm, Shapack Partners, that did Soho House. 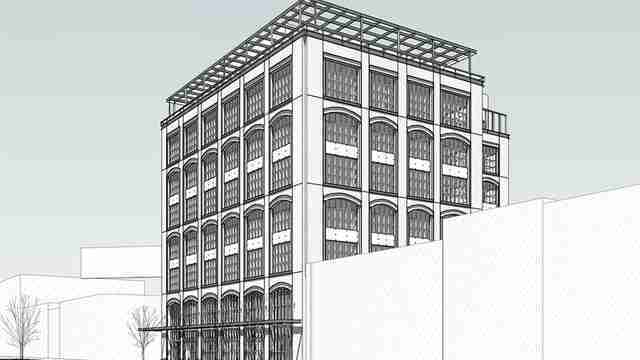 Featuring an industrial steel and glass design, the expected development with not only bring more tourists and travelers to the area, but will add two floors of office space for the neighborhood’s growing creative professional presence. 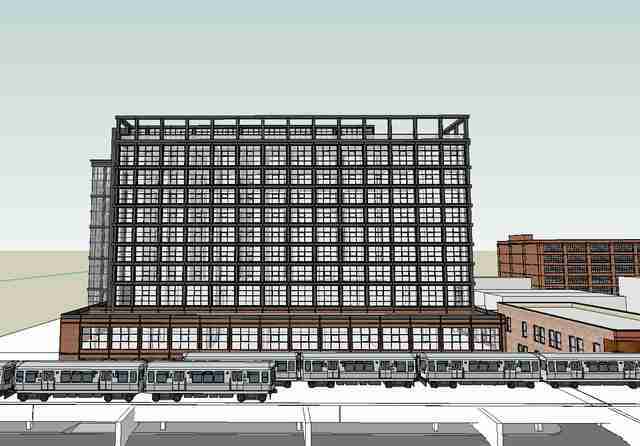 The long-in-limbo One South Halsted building looks like it is finally moving forward as developers must make some kind of progress by June to avoid losing their zoning amendment. 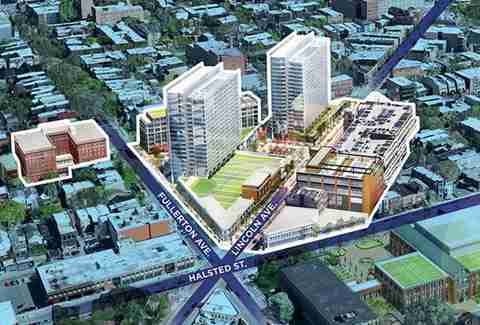 While the whole Greektown area has seen plenty of development One South Halsted would be a defining structure in a prominent location that will further transform the old industrial corridor into the modern urban landscape it seems destined to be. Joining 200 N Green in the category of boutique hotel hopefuls is the Nobu, which will occupy a central space at Randolph St and Peoria. While other development in the area have circled around the hood’s main drag on Randolph the planned hotel will bring some height and flair to the restaurant corridor itself, although the chopped down-size of the building won’t change the streetscape too drastically. And while the 76-room hotel won’t be a overwhelming presence it's sure to increase the foot traffic of wealthy urbanites seeking out small plates and $8 craft beers. 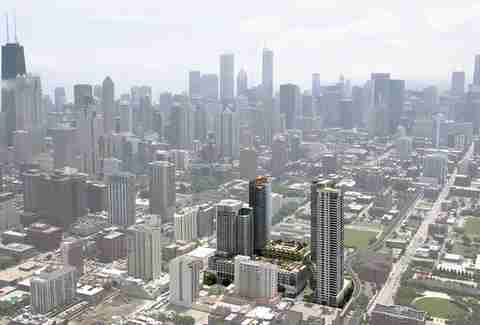 The West Loop isn’t going to be all boutique hotels and luxury condos. With the arrival of Google and the opening of other progressive minded business spaces like WeWork it is also becoming one of Chicago’s hottest spots for commercial development. Taking over a previously unfinished construction, Fulton West is set to be one of the biggest new structures in the area bringing nine floors of state-of-the-art commercial development with the hopes of attracting even more techie and creative workers to the West Loop. 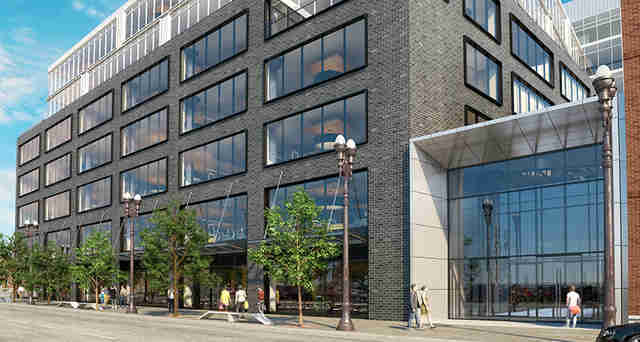 While the area west of Halsted has yet to see office high-rises projects like this are adding an entire new dimension to the population of the West Loop. Matt Spina is a writer living in Chicago who hopes he doesn't get priced out of his fourth straight neighborhood. Follow his struggles @MR_spina.